A Maryland bridge consists of a metal framework with a porcelain tooth connected onto the front of the framework. 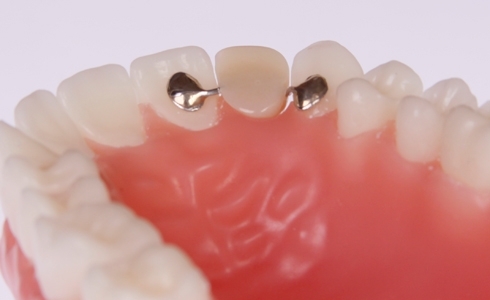 The framework then ends up as a false tooth with one or two metal wings on the side. These metal wings are prepared to have a porous surface so that they can receive a bonding agent and then the wings are bonded to the back sides of the teeth on either side of the missing tooth. The teeth are translucent. The metal backing will cause the teeth to darken slightly, so the result is a slghtely different color than the other front teeth. To overcome this problem we design the framework to fit at the palatal portion of the tooth.